You are here: Home / Edit / How Long Does It Take For A Plastic Bag to Decompose? Researchers fear that such ubiquitous bags may never fully decompose; instead they gradually just turn into smaller and smaller pieces of plastic. The most common type of plastic shopping bag is made of polyethylene, a petroleum-derived polymer that microorganisms don’t recognize as food and as such cannot technically “biodegrade.” The U.S. Environmental Protection Agency defines biodegradation as “a process by which microbial organisms transform or alter (through metabolic or enzymatic action) the structure of chemicals introduced into the environment.” In “respirometry” tests, whereby experimenters put solid waste in a container with microbe-rich compost and then add air to promote biodegradation, newspapers and banana peels decompose in days or weeks, while plastic shopping bags are not affected. Even though polyethylene can’t biodegrade, it does break down when subject to ultraviolet radiation from the sun, a process known as photodegradation. When exposed to sunshine, polyethylene’s polymer chains become brittle and crack, eventually turning what was a plastic bag into microscopic synthetic granules. Scientists aren’t sure whether these granules ever decompose fully, and fear that their buildup in marine and terrestrial environments—and in the stomachs of wildlife—portend a bleak future compromised by plastic particles infiltrating every step in the food chain. A plastic bag might be gone in anywhere from 10 to 100 years (estimates vary) if exposed to the sun, but its environmental legacy may last forever. 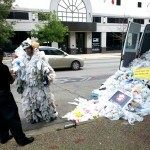 The best solution to plastic bag waste is to stop using disposable plastic bags altogether. You could invest a few bucks in reusable canvas totes—most supermarket chains now offer them—or bring your own reusable bags or backpacks with you to the store. If you have to choose between paper and plastic, opt for paper. Paper bags can biodegrade in a matter of weeks, and can also go into compost or yard waste piles or the recycling bin. Of course, plastic bags can be recycled also, but as just explained the process is inefficient. According to the nonprofit Worldwatch Institute, Americans only recycle 0.6 percent of the 100 billion plastic bags they take home from stores every year; the rest end up in landfills or as litter. Another option which some stores are embracing—especially in places like San Francisco where traditional plastic shopping bags are now banned in chain supermarkets and pharmacies—are so-called compostable plastic bags, which are derived from agricultural waste and formed into a fully biodegradable faux-plastic with a consistency similar to the polyethylene bags we are so used to. BioBag is the leader in this field, but other companies are making inroads into this promising new green-friendly market. San Francisco’s pioneering effort to get rid of polyethylene bags is a positive step, but environmentalists are pushing for such bans more widely. A California effort to ban plastic bags failed again recently, but will likely eventually succeed. Washington, Florida, New Jersey and North Carolina are watching closely and considering similar laws depending on what happens in the Golden State. Worldwatch reports that taxes on plastic bags in South Africa and Ireland have been effective at reducing their use by upwards of 90 percent; Australia, Canada, New Zealand, the Philippines, Taiwan and the UK are also planning to ban or tax plastic bags to help stem the tide of plastic waste. CONTACTS: Worldwatch, www.worldwatch.org; BioBag, www.biobagusa.com.